BugDoc Dave here. Oops! Looks like I missed the first Tuesday which was my day to provide my Stretch Tuesday article! In June, I began to discuss the creamer and sugar sets made in stretch by covering the ones made by Fenton. 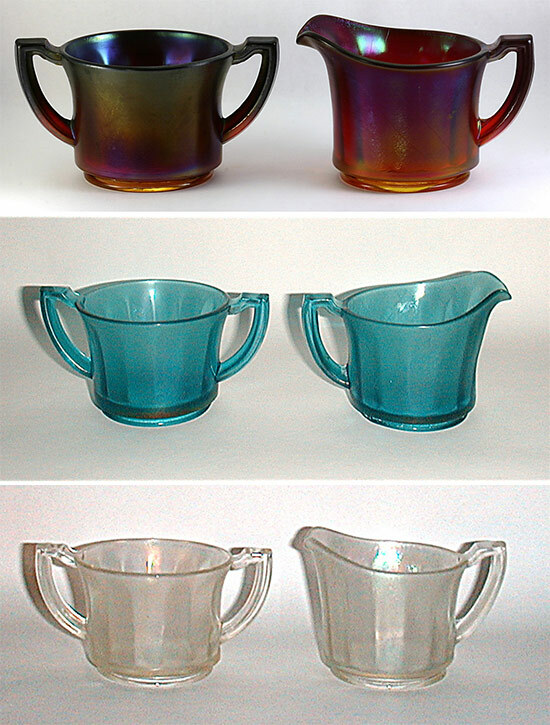 As stated before, not all the stretch glass making companies made creamer and sugar sets and the ones that did often made a limited number of forms even though they made many creamer and sugar sets in their other lines of glassware. Tonight, I’ll present the ones I know that were made by Imperial and Northwood. Neither company made many sets in stretch glass. This is especially noticeable for Imperial as they made many pressed glass table sets before their carnival and stretch production and they made many more afterward (especially in the Depression Era). The first Imperial set was made for their Art Glass Line which we call Imperial Jewels today. What is more interesting is that this set is never figured in any of the Art Glass Line catalog pages, but it is obvious that they belong to this that line. All have ground bases and most have the Imperial Cross logo imprinted in the base. And, they are only found in the Art Glass colors (only Pearl Silver and Pearl Amethyst are known). However, they were given two shapes, an upright form and a squatty form. The illustrated upright set is in a fantastic Pearl Amethyst treatment and you can see that deep greens and yellow dominate the iridescence though the glass is a deep purple. My squatty example is in Pearl Silver. Imperial made only two other cream and sugar sets which were in their normal stretch line. The most obtainable sets are the ones with rib optic interiors. This set is found in ruby, Blue Ice (teal), and Iris Ice (crystal). The other set has only been seen in pink with a light marigold finish and the complete set came with an oval serving plate. The set figured here also has a well-known Imperial floral decal. My final set was made by Northwood and is often called ‘Barbella’ by collectors. This design has thin optic ribs and there is some debate as to what the entire set was called. The only know pieces are all in Topaz (Vaseline) and it appears that two of the pieces have paired handles and they are slightly different in size. When you get the complete set the slightly larger piece came with a lid and most Victorian glass collectors would consider this to be the true sugar and the open piece would be a spooner. In any case, acquiring or assembling the complete set is not an easy task. We also knew of several tumblers in this pattern, but stretch glass collectors had never seen the pitcher until a few weeks ago when one of our HOC group sent in a picture of their Barbella pitcher, again in Topaz!